These days, data bases usually appear early in projects, whereas data shows up all over. 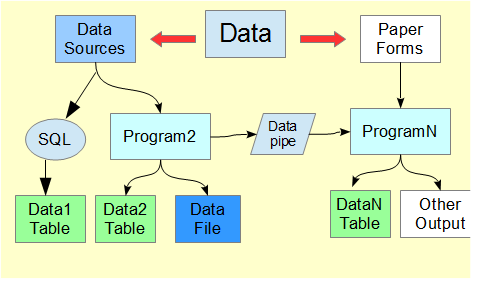 Sometimes the data flows into data tables so that programs can process the data. Other times, programs read the data and put it some where. In some projects, the data controls how the programs run. Programs can also generate data as an output. Since data must exist on paper or on some device, each data store probably has a preliminary step or box.